In October 2016, on a sunny, day, we had a very important visitor. Jan McLoughlin, Director General at the People’s Dispensary for Sick Animals (PDSA) came round to present Molly with a very prestigious honour. 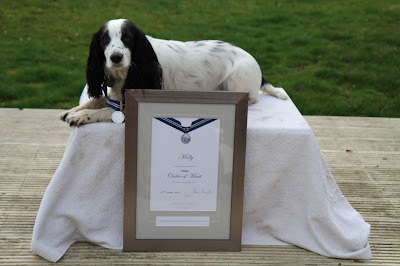 In the same year as I received an MBE in the New Years Honours, Molly was awarded the animal equivalent, the PDSA Order of Merit. She became only the fourth dog to receive the award. It recognises her outstanding devotion to me, as my companion and as my Assistance Dog. 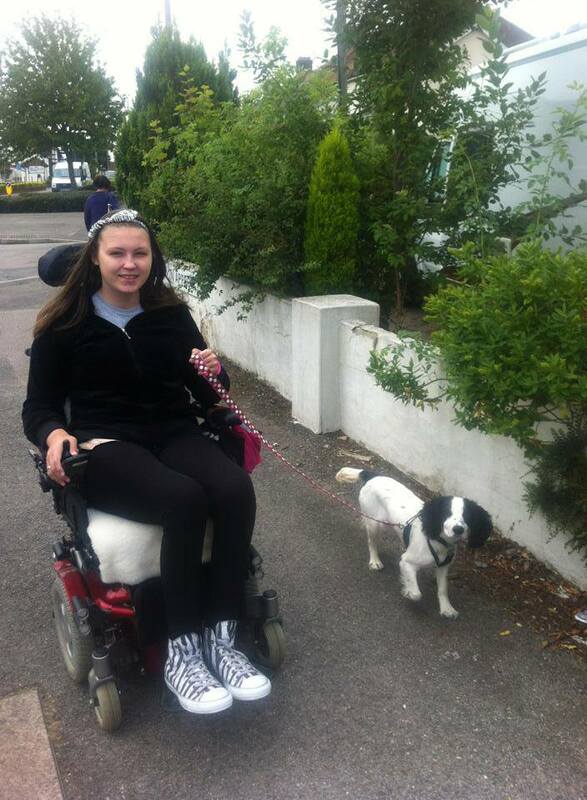 Below is the video of the presentation, and click here to go to Molly’s award story on the PDSA website. Molly has truly changed my life. 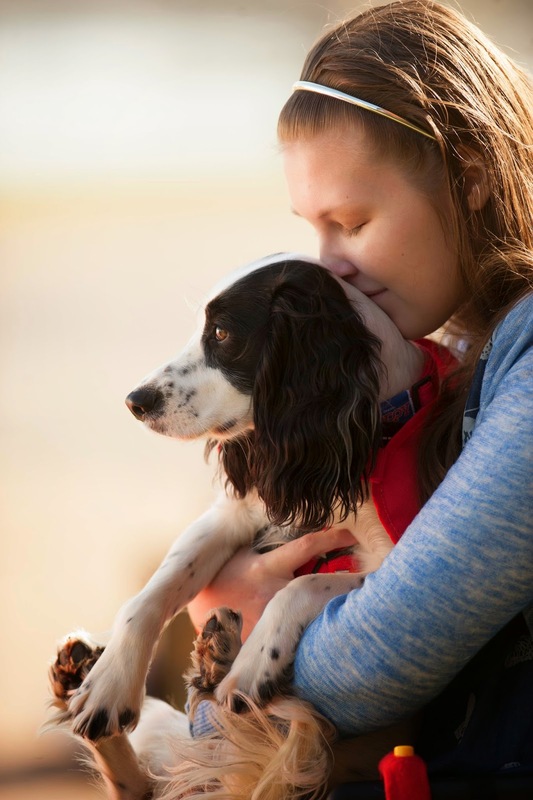 She came to us as an eight week old puppy, and transformed my life, from one spent in bed except for when I attended hospital appointments, to getting out and about and having a life again. Once we got Molly, I was getting out to walk her every day. Not only that, people who were previously too scared to talk to me were striking up conversations with me about Molly. I was also gaining in confidence, too, and so would start conversations with fellow dog walkers. My life was completely changed, from one spent trapped in the four walls of my room nearly all of the time, to getting out every day, and having a life again. I was taking Molly to dog training classes every week too, meeting new people and having fun, for the first time in a long time. The confidence Molly gave me led directly to me accepting to speak at a reception in Parliament for Together for Short Lives. Despite Molly not being there with me, where I had been getting out, meeting people and rapidly gaining in confidence as a result, it meant that I had enough confidence to give the first speech I’d ever given, in Parliament, to around 100 people comprising MPs, charity representatives and eminent hospice and palliative care professionals. It was a huge success, and I have not looked back since. I currently hold 7 positions within charities, have written blogs, articles and forewords, have given a number of speeches at events and meetings, appeared in and presented charity videos and appeared on TV and radio. My life has been taken a direction I could never have foreseen or ever imagined. 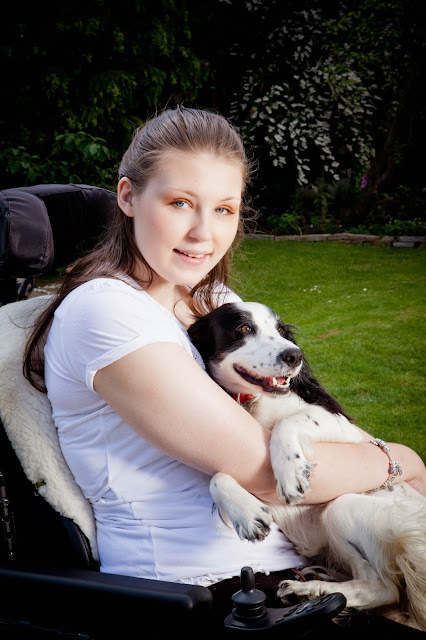 My charity work, which happened as a result of the confidence Molly gave me, led to me receiving an MBE in the 2016 New Years Honours for services to Young People with Disabilities. I would not be Lucy Watts MBE if it weren’t for her. However, Molly had an even more extraordinary destiny than to just be my pet. When she was ten months old, Molly was assessed and then began training with Dog Assistance in Disability (Dog A.I.D.) to become my Assistance Dog. Dog A.I.D. 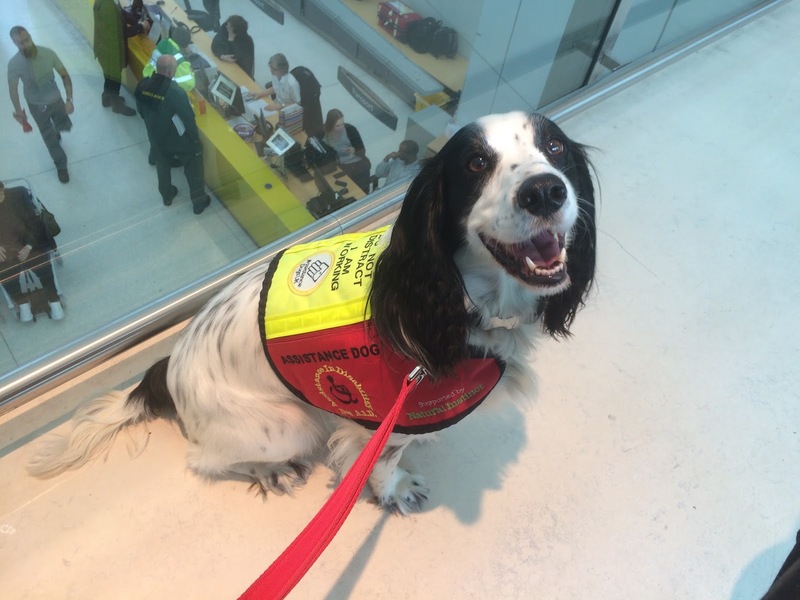 help disabled people train their pet dog to become their Assistance Dog, by pairing them with a volunteer trainer who helps them to get their dog to the required standard and to pass the three levels of training. Molly and I thrived on the training, I loved the fact I was training her myself with help from our wonderful trainer Midge, and things were going so well. Molly and I won Friends for Life at Crufts 2014, being voted winners by the public, and Molly was awarded a Dogs Today Medal. Despite lots of setbacks and time off with my health, Molly and I passed the Level Three assessment and gained Full Assistance Dog Status on the 6th September 2016, so Molly can now come everywhere with me and assist me, and we have our ID booklet and Molly has her posh working jacket. 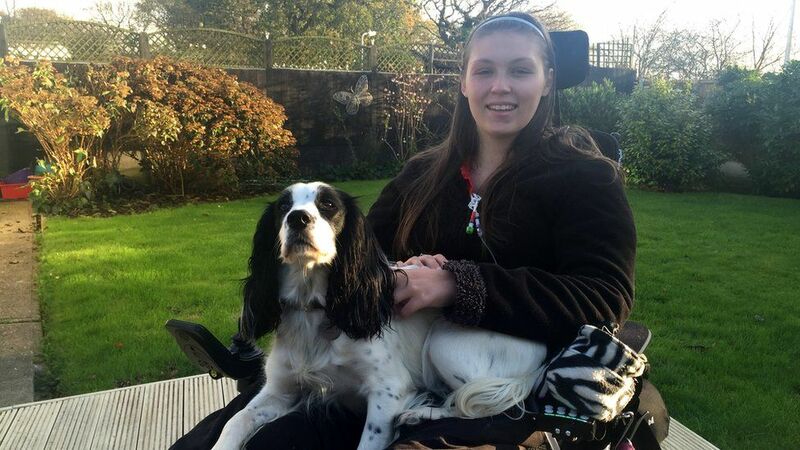 Molly makes such a difference to my life, giving me confidence and allowing me to be less dependent on those around me, and I love having her beside me as I go about my life. She can completely undress me, including my hat, scarf, gloves, coat, jacket, top, trousers, underwear and socks. She fetches the post, picks up dropped items, fetches named items, passes notes between me and my mum or nurses, fetches help, loads and unloads the washing machine, closes doors and will pull my blanket off my lap if I get hot, amongst other things. Molly also alerts me three to four hours before my temperature spikes, giving me a vital warning that I will become poorly, since I don’t get signs or symptoms of an infection until I have developed or am scarily close to developing sepsis so the warning gives me time to act. She wasn’t trained to do this, it is something she does naturally. I love having her beside me every day, making me less dependent. She is a welcome guest at my charity events and meetings, people love having her there, and for me I feel less like a burden. If I get hot, Molly can take my coat or jacket off, or pull my blanket off my lap, without asking someone to help me. If I drop something she will automatically pick it up, saving me from asking my nurse to pick things up time and time again, leading me to constantly apologise for dropping it. For Molly, all of this is a wonderful, fun game, she loves doing it, so I don’t feel bad when I drop something for the twentieth time, or I suddenly get hot and want to take my jacket off. She makes me feel less of a burden. Molly changed my life, and is the light of my life. She was the only reason I kept going when mum was diagnosed with a brain tumour and suffered a stroke after the operation, she is my focus to keep going when I am poorly or in hospital, and when I am feeling down, she is there bringing comfort, company and I can stroke her and she will even lick the tears off my face when I cry. Walking her every day gives my day structure, and I love it so much. She makes me smile and laugh, and she keeps me going. Now, she’s not just my dog, but my four legged carer. Molly also has her own blog, with over 3,700 followers. She brings light and laughter not only into my life, but theirs, too, through sharing her adventures and antics with her followers. 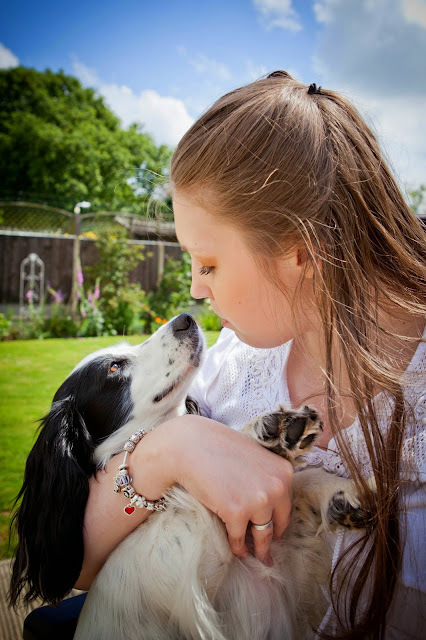 You can follow Molly’s Facebook blog here – Molly, Dog With A Blog. Molly is my life, and she is a dog in a million. 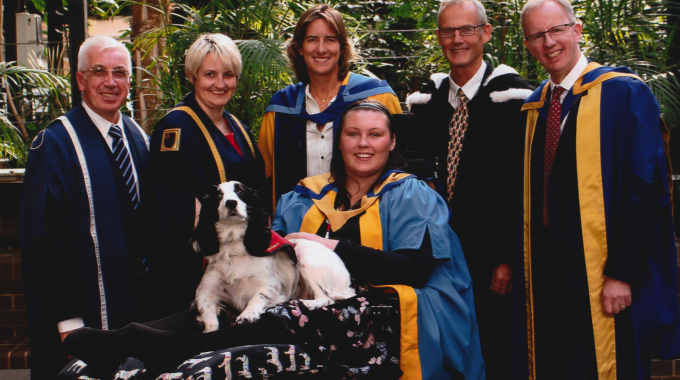 I am so pleased that the PDSA have recognised just how extraordinary she is, and that they think her worthy of an award such as the PDSA Order of Merit. 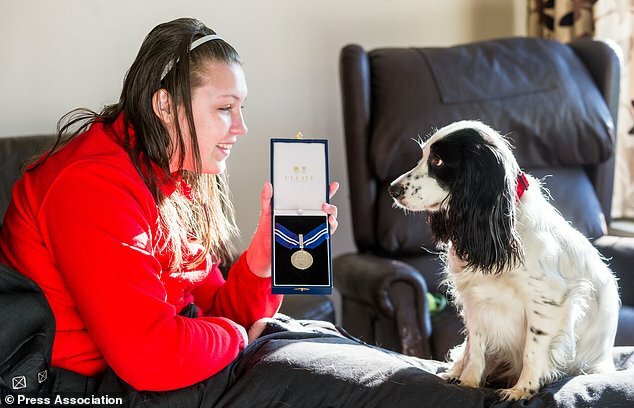 To be only the fourth dog to have received the award, it just shows how special she really is. 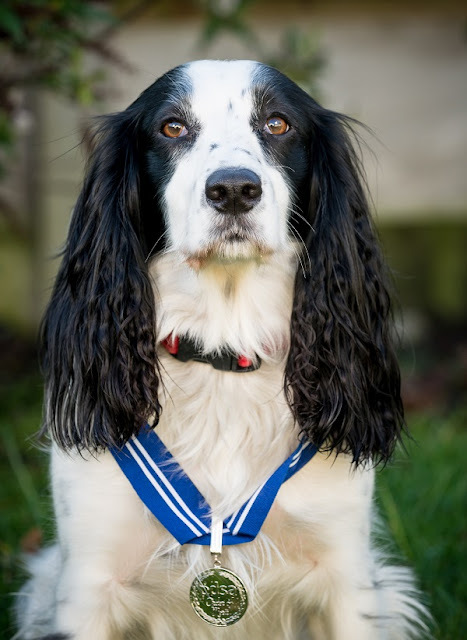 The PDSA runs a world-renowned animal honours programme, which included the animal version of the Victoria Cross, the Dickin Medal, for military animals, alongside awards recognising non-military animals for their outstanding devotion to duty and/or their owner. Molly has become one of an elite group of animals recognised by the system. I love dogs. They are my favorite animals. And the fact that one of those got an award for appreciation makes me so happy. Love it.